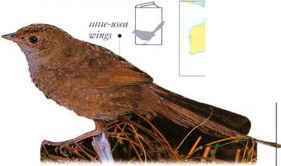 A bird of scrub and grassland, often near forest edges, this species forms small parties that hop on the ground and search in the undergrowth for seeds and insects. 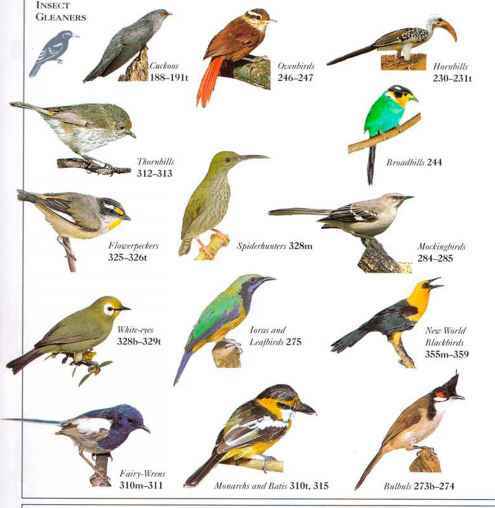 Usually only one male is in blue plumage in each party. Birds make short flights between bushes. 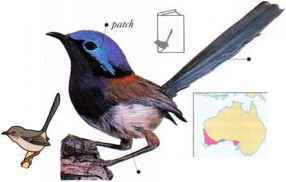 • REMARK Plumage pattern varies in the three geographical subspecies. 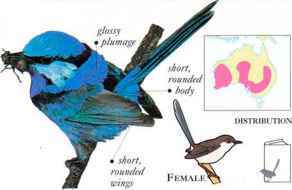 1 his spectacular bird occurs in woodland and scrub. It is often seen in small parties consisting of a dominant pair with "helpers "; all feed, roost, and nest together. The birds forage in groups on the ground, looking for insects and other small invertebrates. • NliST An oval structure with a side entrance, made of grass and bound together with spiderwebs, lined with plant down or feathers, and placed in a low bush. • NEST A round nest with a side entrance, constructed of coarse grasses with a liner grass chamber, placed on the ground or in a grass clump. • DISTRIBUTION S.E. Australian coastal strip from Brisbane to E. Victoria.